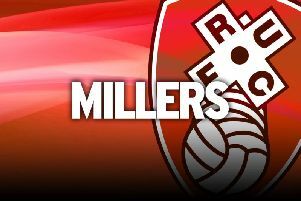 Rotherham United’s Championship status played a big part in persuading the man who once cost £1.5 million to join the Millers. Former Sheffield Wednesday defender Joe Mattock signed a deal at AESSEAL New York Stadium yesterday and admitted: ““It was a massive factor. The left back, who commanded a £1.5m fee earlier in his career when he left home-town club Leicester City to join West Bromwich Albion, has spent all but two seasons in the second tier. The 25-year-old, who was freed by Wednesday at the end of last season, became the Millers’ second signing of the summer after left midfielder Aidy White joined the club in midweek. And there could be another new arrival next week, with the club in advanced negotiations with at least one other target. Mattock spent three years at Hillsborough and played 30 times for the Owls last season, including the New York derby which the Sheffield side edged 3-2. He added: “The move has come about pretty suddenly really, My agent got in contact with me about two weeks ago and told me that Rotherham were interested in signing me. My first thoughts were positive because I’ve been up north in Sheffield for the past few years. Manager Steve Evans has pledged that Rotherham will be a tougher Championship proposition next term than they were last season. The Millers stayed up by five points, shrugging off a three-point deduction by the Football League to cement their second-tier status. And Evans says his side have to kick on from that achievement when hostilities resume again on August 8 - because others teams will be improving as well. “We have had the Championship for a season and want to be part of it, ongoing,” he said. “We are proud of some of the things we’ve achieved, but we will be better next year. Evans says he wants more new players in place by the time pre-season training begins on June 30, and is looking for around seven new signings before the transfer window closes. Former Leeds United favourite White was unlucky with injury last season but is a seasoned Championship campaigner and was highly regarded by supporters at Elland Road. The 23-year-old appeared as a substitute against the Millers on the final day of the season and, now he has a clean bill of health, is targeting a regular first-team slot next season. “I came on for the last 20 minutes and it was fantastic to be back playing,” he said. “I wanted to make an impact because I’d been out for so long, and I felt like I did.